Growing a teeny, tiny human in your tummy is seriously the most amazing and beautiful thing in the world (even if you don’t feel like it sometimes)! Let me help you show off that adorable baby bump and remember that extra special time in your life. Generally the best time to schedule a maternity session is between 30 and 36 weeks. However, each woman and each pregnancy is different so do what feels right to you. You will want to be showing with a big, beautiful belly but the most important thing is that you are comfortable throughout your session. The clothes that you wear during your session will play a vital role in how you feel during the shoot and about your photographs. We really want to show off your beautiful form, so choose a few outfits that accentuate your body and especially your belly! You can choose your favorite maternity outfits but solid colors work best. As far as specific colors, it is completely up to you. The most important thing is that you feel comfortable, confident, and beautiful! You can show as much or as little belly/body as you’d like. Feel free to bring along several outfits. I have a private dressing room in the studio for you to change in. I have three beautiful maternity dresses in black, white, and pink specifically made for maternity photo shoots, several types of beautiful fabrics on hand for draping, blowing in the wind, or silhouette shots. If you are interested in using the fabrics in your photographs, it’s a good idea to bring along or wear a strapless bra so we can tuck the fabric into it and clip it from behind. Feel free to send me a few ideas that you like from Pinterest so I can get a feeling for the type of photographs you are interested in achieving. Although I may not be able to replicate the exact photo or accommodate all of the ideas, it will really give me a sense of the overall style you’d like to achieve. 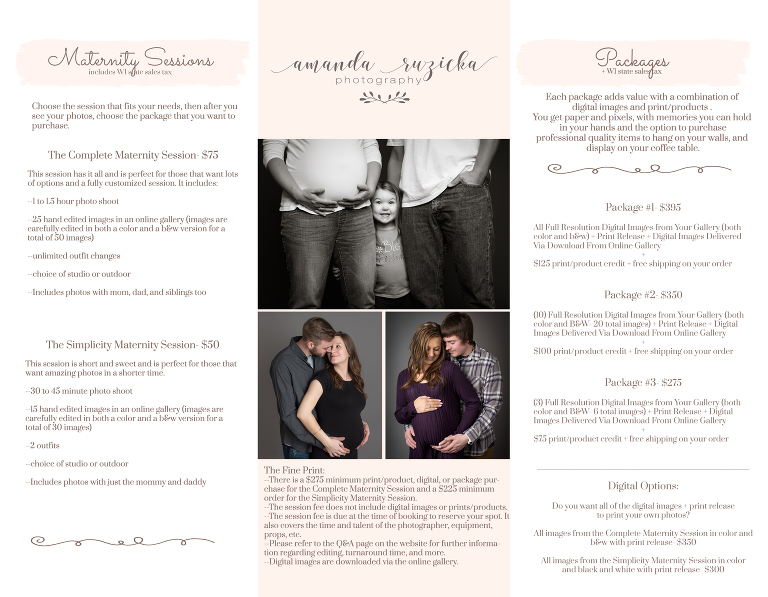 Daddy and sibling(s) are encouraged to participate in the maternity session as well. It’s a special time for all family members. One other thing to remember in preparation, avoid wearing tight fitting clothing before the session that will leave unwanted red marks if you are planning on showing your belly during the session.